Nothing feels worse then paying for traffic...except paying for traffic that you don't want! 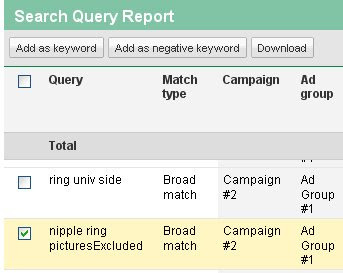 "http://twitpic.com/5ks6i - Just figured out I can see raw queries in the new #adwords interface: Campaigns > Keywords > "See search term..."
I was impressed with the importance of this new feature. "Raw queries" are what a searcher actually typed into the search engine which resulted in triggering an ad for one of your keyword bids. Phew, long sentence. You try to save money where you can! Every little bit counts. If you want even more details then what googles raw queries tell you I found this great post on www.wpromote.com What they recommend is to employ what they call the “Google Analytics Raw Query Hack”. It is easy, non-technical and completely free! Check out their site for more info on how.